Deploys at initial dispatch providing multiple backhaul pathways to high speed internet connections, while establishing a local area network. Supports LTE, Wi-Fi, Ethernet, Common Carrier Cellular and FirstNet™ (pending qualification by AT&T). On-board 19” rackmounts and multiple power sources enable this mobile desk-style form factor to rapidly deploy IP, radio and video technologies at a shockingly low overall cost. "... very portable and highly capable, at a cost that virtually any department can afford." 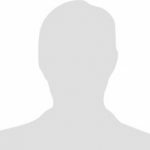 "The PodRunner® team’s insight, engineering chops and sense of humor all factored into an end result of the highest quality… when we opened up our first new PodRunner® I actually felt joy." "We used grant funding to purchase three Command-Runners™ equipped with primarily amateur (Ham) radios. We couldn’t be happier with them." "MABAS Illinois has deployed five PodRunners® as part of our Incident Support Teams (MIST) throughout the state. They deploy quickly, are highly mobile and very budget friendly." PodRunner® is designed to deliver all-in-one, ready-to-use wireless communication technologies, quickly, intuitively and at a low cost. The Star-Runner CRD™ provides a low cost delivery platform with four unique backhaul pathways to the internet, including automatic fail-over and heal-back programming. It establishes a robust hastily formed local area network (HFN) with both Wi-Fi and Ethernet connections. Missions include temporary high speed internet connections for Emergency Operations Center (EOC) deployments, Type 1 Incident Base Camps and backup systems for public safety and business, when terrestrial cellular or fiber connection fail or simply don’t exist. Real time internet-dependent operations, both public and private sector can depend on Star-Runner CRD™ for business continuity and disaster recovery. 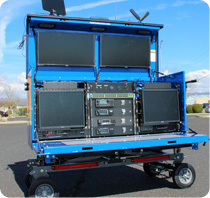 Command-Runner CRD™ deploys an Incident Command Post desktop with an on-board server, peripherals and UHF, VHF or Ham (Amateur) Radios. You decide what technology goes inside! The PodRunner® engineering staff is agnostic on brands, models and colors, but capable of engineering and integrating the perfect system for your specific department needs. Our Command-Runner™ is configured with 24U of empty 19” Rackspace for the integration of technologies supporting many emergency response functions including: Incident Command Posts, Unified Incident Command, Tactical Dispatch, Portable PSAP Consoles, 911 Call Centers, All Hazards Incident Management Teams, (AHIMT) Command Posts, Public Information Officers (PIO), Liaison Officer Posts, Finance/Admin Section Posts, Mobile Operations Units, Planning Units, Logistic Units, Comm Units, Drone Bases, Medical Triage, IOPS Communications and ARES Ham Radio Command Posts. All units come equipped with generators and batteries to run off the power grid for extended periods. 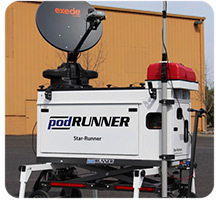 In recent successful testing we incorporated Band 14 and Band 2 eNodeb radio systems onto the Star-Runner CRD™, with a licensed connection to a FirstNet™ EPC test core. Using a dual arm telescoping mast we deployed two 5 Watt Band-14/Common carrier band cellular radios. This adds a public safety cellular bubble to our capabilities, enabling our form factor to serve the Network Disaster Recovery (NDR) and Customer Owned & Maintained (COAM) deployable marketplaces. The Star-Runner CRD™ is in a class by itself; that is why we named it CRD™ - Compact Rapid Deployable™. It is far less expensive than a Cell on Wheel (COW) or Cell on Light Truck (COLT), has a deployable duty range that can outreach trailers or large vehicles, deploys quickly, and boasts the lowest total cost of ownership in the deployable assortment. Pending qualification by AT&T – FirstNet™ it can enable on-site public safety cellular coverage, at the speed of initial dispatch, for the new National Public Safety Broadcast Network (NPSPN).